This is another of my favorite views of the grand spiral staircase located within the Royalton Mansion at Roslyn Country Club in Nassau County, New York. I have a great deal of experience photographing weddings at this amazing venue. As you explore my web site you will see many extraordinary images created at The Royalton. One image has become my "Signature" Royalton shot and is requested by every single one of my brides when we take wedding pictures there. I always strive to find new ideas, new angles and fresh new perspectives when I photograph weddings. I want all of my client’s wedding memories to be special...to be unique...to express their tastes and personalities. To create this particular image, from this vantage point, requires a very expensive wide angle lens that very few wedding photographers own. It also requires the finely-honed techniques of my highly-skilled photographic assistant who is lighting the scene for the dramatic impact of this wedding picture. 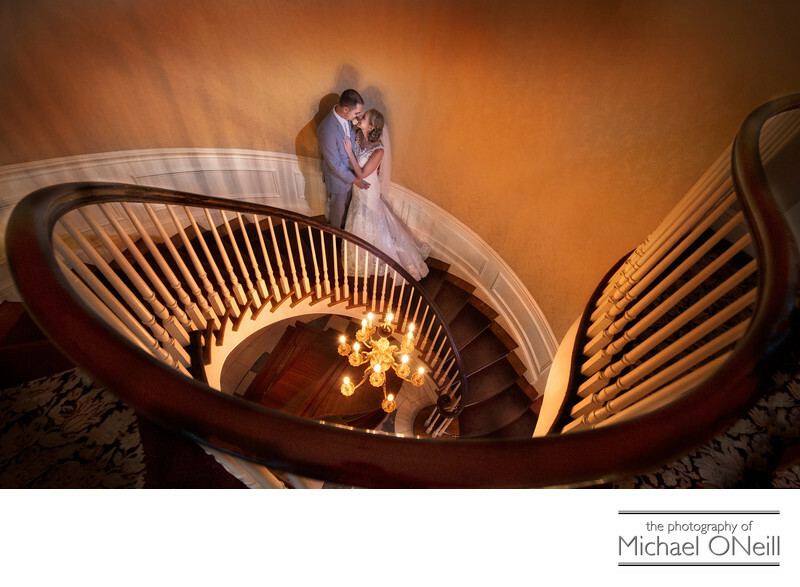 Staircase wedding photographs are synonymous with elegant wedding imagery. I love this spiral staircase at The Royalton but also love the grand staircase at Larkfield Manor and the incredible grand entrance double staircase at Oheka Castle in Huntington, NY. If you’re looking for a wedding photographer who has a fresh, new perspective on wedding photography you owe it to yourself to give me a call as you make your plans for the big day.